A new 2018 VW Amarok V6 Ultimate Ute has loads of features – sound safety, luxury and comfort – but for those who know a little bit about the Ultimate V6 580 engine under the hood, this is the most powerful TDI engine you’ll find powering this type of vehicle. It’s a good thing I let you know because that might be just the push you need to leave your old Hilux and venture into the world of the most powerful luxury ute in its class. The word Ultimate means: being the best or most extreme example of its kind. And I think it’s fair to put the Amarok V6 Ultimate at the top of its class and call it the Ultimate because it has so much to offer. Gone are the days that most ute owners would settle for just the bare necessities. As a ute is often a mobile office you can end up spending a good part of the day inside the ute cabin, so it had best be comfortable and be able to cater to the modern business man’s (or woman’s) needs. Firstly, comfort starts in the driver’s seat. Slip inside the new VW Amarok V6 Ultimate’s driving seat and you’ll know straight away that this is the set-up that offers superb comfort for the long haul. The Amarok V6 Ultimate 580 is comfortable with fantastic front seats. There is excellent support that is backed up by really good cushioning. So, with the combination of a height and reach adjustable steering wheel and an electronically adjustable driver’s seat you can easily find the best driving position for your unique body size. This is a ute with loads of comfort for touring and everyday commuting. 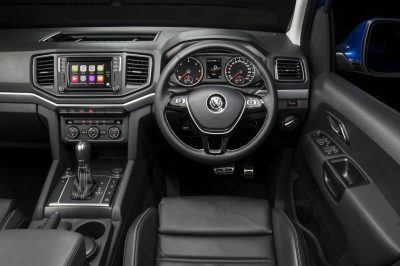 As far as interior styling goes, the new VW Amarok V6 580 Ultimate is typically Volkswagen. The materials are nice, the trim tidy with a splattering of chrome even, and all the switchgear is very well-ordered. If you’ve been in any of the other modern Volkswagen products, then the same distinct and simple class is what you’ll find in the new Ultimate Amarok ute. Being a ute, the plastics are tougher and not as pretty as a luxury sedan, but they definitely don’t feel cheap or flimsy. The steering wheel is finished with contrast leather stitching, while the equally-nice accented Nappa leather upholstery seats are sumptuous for both front and rear occupants. 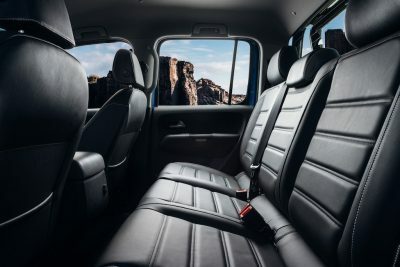 The front seats boast two-step heated seats, and the cabin has a very strong climate control system that’s quick to change temperature and keep occupants cool on a hot summers day. A modern VW infotainment system is well presented through a large central touchscreen and boasts Apple CarPlay, Android Auto, Bluetooth communications, satellite navigation and loads more. The infotainment system has easy Smartphone connectivity for simple phone mirroring. As far as sound system quality goes the surround sound is excellent for picky musical ears. Safety equipment is good, and the V6 Ultimate Amarok is a strong unit. The Amarok Ultimate Ute is bigger and roomier than most of its rivals, and that’s most obvious in the back tray out the back. It’s really easy to fit a pallet between the rear wheel arches. Out on the open road the new Volkswagen Amarok V6 Ultimate 580 ute is a star performer. The AWD has loads of grip through the corners, and the handling remains composed even when pushed hard. The huge power that’s on offer is well controlled, yet easily accessible. Braking is excellent and there is ABS and ESC to keep you pointing in the right direction should the surface become slippery. It’s also fairly quiet at speed. Off road the AWD system works well, though there is no low range. Still, you’ll likely be impressed with the way the Amarok V6 Ultimate can plough on through when things get tough – particularly with all that power on tap. So, the 580 in the Amorok Ultimate’s name refers to the huge 580 Nm of torque that’s on tap right from down low in the engine revs. This ute also comes with 190 kW of power which over-boosts to 200 kW for ten seconds when more than 70 percent of the throttle is used. This is the most powerful ute this side of a Dodge Ram, but the Ram is in another class of its own (it’s basically a small truck). 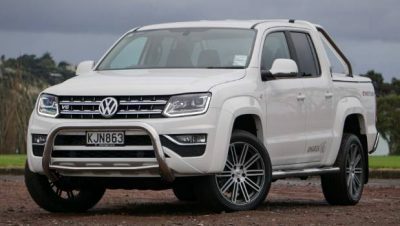 This level of grunt the V6 Amarok has makes it the quickest ute available. The Volkswagen Amarok V6 Ultimate 580 is capable of a quick 7.3 second 0-100km/h sprint. It’s actually pretty fast! In fact, this sprint is a couple of seconds quicker to the speed limit than almost all other diesel double-cabs. The popular vehicles in this segment are the Toyota Hilux, Ford Ranger, Holden Colorado, Mitsubishi Triton, Mazda BT-50 and Nissan Navara. Those who after bragging rights to the most powerful ute in the class will want a new VW Amarok V6 Ultimate – no doubt about it! The closest muscle that almost matches the Ultimate Amarok is also German; and it is the new, stylish Mercedes-Benz X-Class. These two are battling it out for power honours. Where the popular ute choices have an advantage is in tow capacity and payload. The VW Amarok is a little off the pace in this crucial area. Still, an over 3 tonne towing capacity and around 850 kg payload is still pretty handy. A brand new VW Amarok V6 Ultimate 580 ute will set you back a bit over $70k. For what you get I wouldn’t be complaining too much. Sitting on premium 20-inch alloys, a nice black roof interior head lining and pillar trims, chrome bull bars, and sports bars make it a statement of power; and it all hints to this muscle ute’s big ticker. 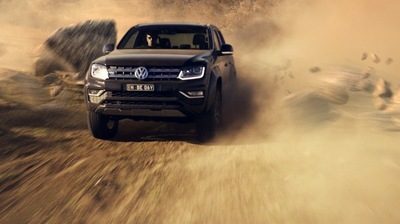 For any more information on the new Volkswagen Amarok models or, for that matter, any other new car, contact one of our friendly consultants on 1300 303 181. If you’d like some fleet discount pricing (yes even for private buyers! ), we can submit vehicle quote requests out to our national network of Volkswagen dealers and come back with pricing within 24 hours. Private Fleet – car buying made easy!